By 2011, a record 5.6 million immigrants from Latin America and the Caribbean had become naturalized, but an even larger number—5.8 million Latin American and Caribbean immigrants—are currently eligible to apply for citizenship but have not done so11. According to the Pew Hispanic survey, about four-in-ten (45%) say the primary reason for not naturalizing is either personal (26%) or administrative barriers (18%). Among those who have not yet naturalized, the desire to do so is great. The survey finds that more than nine-in-ten (93%) Hispanic immigrants who have not yet naturalized say they “would” naturalize if they could. Overall, the expressed desire to naturalize is the same among current Hispanic green card holders (including those who have been approved for one) and among those who say they are neither U.S. legal permanent residents nor U.S. citizens12—96% and 92%, respectively. The former group—green card holders and those who have been approved for a green card—represent those who could become U.S. citizens sometime in the next few years. The latter group—Hispanic immigrants who are neither U.S. citizens nor U.S. legal permanent residents—represent those who would not qualify for naturalization due to their current immigration status. 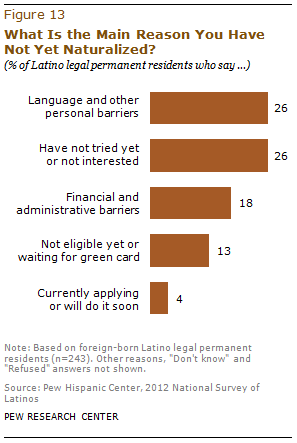 Among Latino legal permanent residents (LPRs), when asked the main reason that they had not naturalized thus far, 45% identify either personal (26%) or administrative (18%) barriers. Among those citing personal barriers, a large majority (65%) say they need to learn English, and close to a fourth (23%) say they find the citizenship test too difficult. Also, more than nine-in-ten (94%) of those citing administrative barriers say the reason they have not naturalized is the cost of the naturalization application. For Latinos holding a green card but who have not yet applied to become a U.S. citizen, just 9% say they have no interest in doing so, while 17% say they have not yet tried to get naturalized (or give some other explanation). 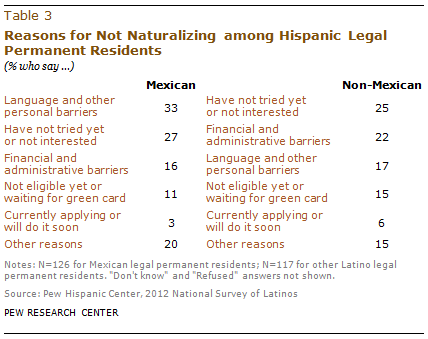 Also, some 13% of Latino LPRs interviewed say they are not yet eligible to naturalize. According to U.S. Department of Homeland Security requirements, in order to apply for U.S. citizenship, an LPR needs to spend at least five years holding a resident’s card—or three years for those married to a U.S. citizen—before becoming eligible to apply. LPRs of Mexican origin and those of non-Mexican origin cite different reasons for not naturalizing. Almost half (48%) of Mexican-born green card holders say the main reason they have not yet naturalized relates to either personal (33%) or administrative (16%) barriers. This compares with about four-in-ten (39%) green card holders who were born in a country other than Mexico who say they have not naturalized due to personal (17%) or administrative (22%) barriers. By about a two-to-one ratio, Mexican legal permanent residents are more likely than their non-Mexican counterparts to say the main reason they have not become naturalized is language and other personal barriers (33% versus 17%). Mexicans are almost twice as likely as others to say that they either lack English proficiency (21%), find the test too difficult or are afraid of taking it (8%) or have tried to naturalize but did not succeed (4%). Financial and administrative issues, such as the cost of naturalizing, are slightly less of a reason that Mexican legal permanent residents (16%) not to naturalize compared with non-Mexican legal permanent residents (22%). Who Cites Language and Other Personal Barriers? Latino legal permanent residents with lower levels of educational attainment, income and English proficiency and with fewer years in the U.S. are more likely to cite language and other personal barriers as their main reason for not naturalizing. Four-in-ten (40%) of those with less than a high school education indicate that language and other personal barriers are the primary reason for not naturalizing, compared with 9% of those with at least a high school diploma. Those who speak English just a little or not all are about three times as likely to respond that language limitations are their primary rationale for not naturalizing (35%), compared with 8% who speak English very well or pretty well. Non-citizen Latino legal permanent residents with household incomes of less than $20,000 (34%) are almost twice as likely to cite language and other personal barriers as those whose household income is $20,000 or more (19%). Similarly, those who have been in the U.S. more than 20 years (35%) are about twice as likely to select language as their primary reason for not naturalizing as are those who have been in the U.S. less than 20 years (19%). Those who have children under age 18 (32%) are also significantly more likely those who don’t (20%) to cite language and other personal barriers as their primary reason for not naturalizing. Who Cites Financial and Administrative Barriers? Financial and administrative barriers—such as the cost of gaining citizenship or its complexity—are more likely to be an impediment for naturalization for older Latino legal immigrants and those with lower household incomes. Among Latino legal residents, those who are 50 years or older and those who have been in the U.S. for two decades are more likely to say that money or the complexity of the process are the main barrier to them in gaining naturalization. About three-in-ten (28%) of Latino adult green card holders 50 years of age or older identify these barriers, compared with just 14% of those under 50. Likewise, almost a fourth (24%) of those who have been in the U.S. for 20 years or more give these reasons, compared with 13% or those who have been in the U.S. for less than 20 years. As would be expected, Latino green card holders with household income below $20,000 a year are more likely to identify financial and administrative barriers as the main reason they have not become citizens, compared with those earning $20,000 or more per year—22% versus 13%. Unmarried Latino legal residents and those without children under 18 living with them are also more likely to identify financial and administrative barriers as the main reason they have not naturalized. Who Cites “Have Not Tried Yet or Not Interested” for Not Naturalizing? About four-in-ten Latino green card holders who say they speak English very well or pretty well say the reason they have not naturalized is a lack of initiative or interest. This compares with two-in-ten Latino green card holders who say they speak English less well. Latino legal immigrants who have household incomes of $20,000 or higher are also more likely than those with lower incomes to say the reason they have not naturalized is that they lack initiative or interest—31% versus 22%. About a third of those who have been in the U.S. for less than 20 years say the reason they have not naturalized is lack of interest or initiative, compared with about one-in-five (19%) of those who have been in the U.S. for 20 years or more. Among Latino green card holders, males are 10 percentage points more likely than females to say they have delayed naturalizing mainly because of a lack of interest or initiative—31% versus 21%.